Kolokassi, from its ancient name “colocasia esculenta”, known as taro, is a root vegetable prepared the same way as potato. 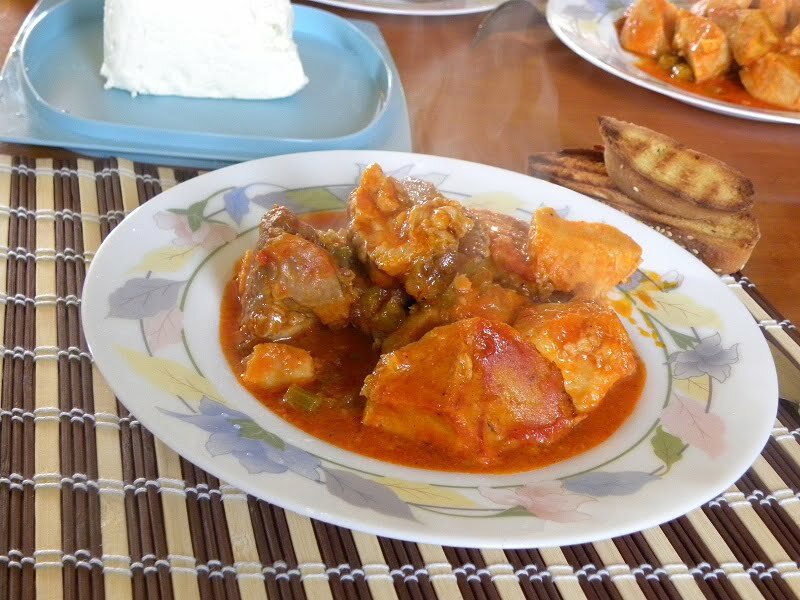 Chirino me Kolokassi, is a recipe from the Cypriot cuisine, which is stewed pork with taro. Kolokassi is a root vegetable also known as wild taro, dasheen, elephant ears or Colocasia esculenta, usually cooked with meat and goes well with pork but also chicken and beef. Apart from Cyprus, this root can also be found in Greece but only on the island of Ikaria, in Egypt but also in Hawaii and Tahiti and in other parts of the world. This root is available from February to December and it can be stored for some days. I stored it in the refrigerator for two weeks and it was in perfect condition. Taro is most commonly prepared the same way as potato. To prepare, peel the skin thickly and cut and break into large pieces as otherwise a mucilaginous, sticky juice, which will be released and the kolokassi will melt while cooking. Taro can also be prepared by cutting away the skin and leaving whole, rubbing the flesh with lemon juice then frying or baking slowly in oil until tender. Baby taro are called “poulles”. They are peeled the same way as taro, without washing them. To cook them, cut them in the middle and shallow fry them (I fry them in olive oil). I remove the oil, put them back in the frying pan and add coarse sea salt, crushed coriander and lemon juice. They are served as a side dish. On the right side of the picture with “louvi“, there is a platter with “poulles”. The traditional way of cooking Chirino me Kolokassi (stewed pork with taro) is to fry the meat and taro in a lot of oil and then transfer ιτ in a saucepan with the oil and the tomatoes, celery and spices. It is then simmered until the meat becomes tender and the sauce thick. However, if you fry them in a non-stick sautéing pan, then you don’t need too much oil, making the dish much lighter. Recently I visited Cyprus and could not resist the temptation of bringing two roots with me. I stored them in the refrigerator waiting for my son to return from Crete, where he has been working since April. Well, yesterday he returned and as it is one of his favourites, I prepared it for him and it was delicious. To prepare the kolokassi, cut the ends and peel the skin. Hold it with a paper towel taking care that you do not soil the rest of kolokassi with your hands. Do not wash but wipe with a paper towel if necessary. With a sharp knife, cut across 1 ½ cm (½ inch) thick halfway then break off. Repeat to the end. Heat the oil in a sautéing pan and sauté the kolokassi. Remove to a platter and sauté the meat as well. Turn the meat over and add the onion and garlic and sauté until translucent. Return taro back to the pan, add the celery, season with salt and pepper and add the tomatoes. Finally, add water and bring to a boil. Cover pan, reduce heat and simmer for about an hour until both meat and kolokassi are tender and sauce is ready and thick. The same recipe can be made vegan without the meat and served as a side dish. It is cooked same as above, until taro is soft. Ivy, taro is something very foreign to mainland Greek cooking and I’m suprised and delighted Cypriots use it in cooking. It’s cheap here (Asian markets) and I’ll have to try this. Peter, try it this way and you’ll see how tasty it is. I am sure you’re going to love it. to kolokasi to eheis kanei sta genethlia tou georgaki pou tou aresei?? ohi, to savvato to kaname kai egine poly oreo. @ Georgie Raphael. I have e-mailed you but the e-mail has returned as undelivered. Please check and see if you have sent me the correct e-mail address. Ivy, I love all your Cypriot recipes. You are a great ambassador for Cypriot cuisine, as you cannot find any Cypriot recipes online! Wow, stewed pork with taro sounds so delicious! Hello guys, kolokasi in latinamerica is called Niame (ñame)and we looove it! !